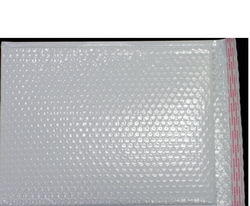 Prominent & Leading Manufacturer from Vadodara, we offer self seal bubble bag. We are suppliers of Permanent Self-Seal Bubble Bags with multi-layer polythene bubble film for superior protection with permanent closure. The smooth interior makes inserting and removing product easy while the strong bubble exterior gives your product the extra protection it needs during transit.